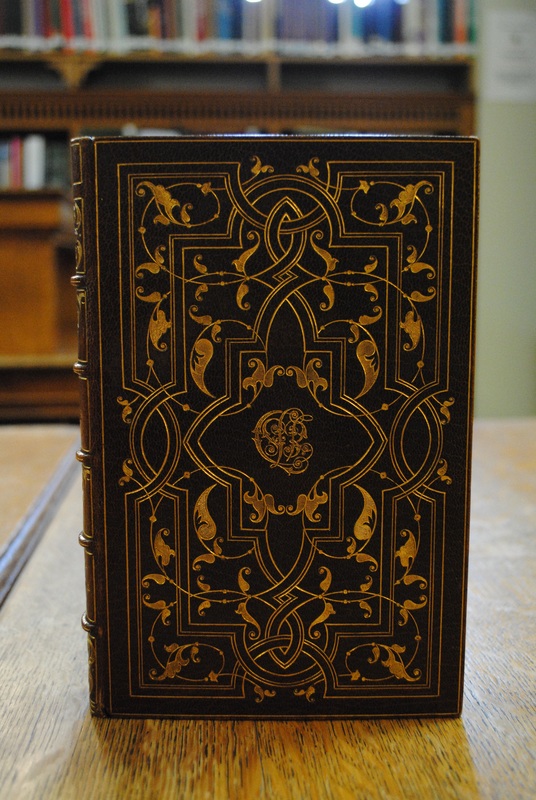 One of the most beautifully bound copies of Walter Pater’s (1839-94) controversial first book, Studies in the History of the Renaissance (1873), can be found in Brasenose College Library: brown crushed Levant morocco, gilt and elaborately tooled with fillets and arabesques, and scarlet silk end papers. 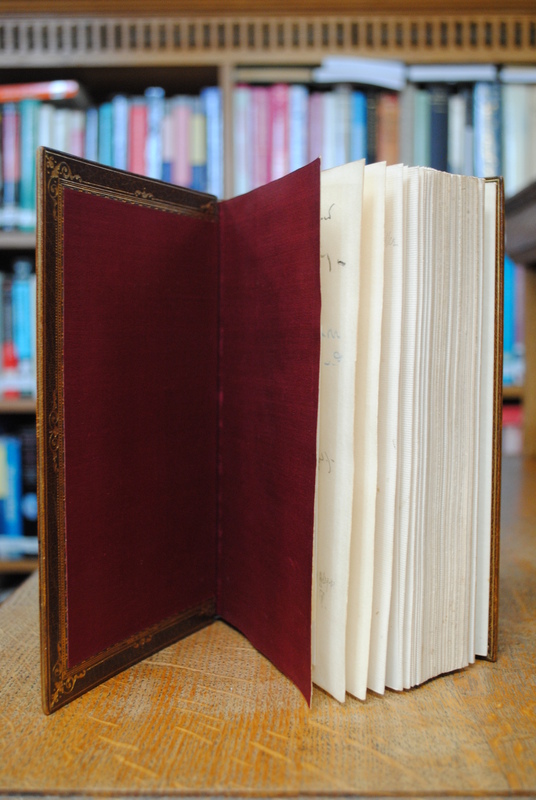 When I first came across the volume, some seven years ago, I wondered about the identity of the Paterian devotee who had gone to the expense of having the book so lavishly bound. Was this done to give the owner immediate pleasure or with the aim of preserving the volume for posterity, enshrined in leather and gold? The book exudes an air of refined feminine taste. Inside the binding the date ‘1898’ is stamped, and the inscription on the title page reveals it as a presentation copy: ‘From the Writer. Emilia’. Clearly, the owner of the book, if she was identical to the dedicatee, was someone with whom Pater was on sufficiently intimate terms to address by her Christian name. Emilia Pattison’s review reflects a critic with a keen visual imagination, an eye for style and a rigorous perception of art historical method. Fiercely critical of Pater’s subjective and ahistorical method, she was, however, fully discerning of his discriminating powers of aesthetic judgement and alert to the almost incisive precision of his prose. 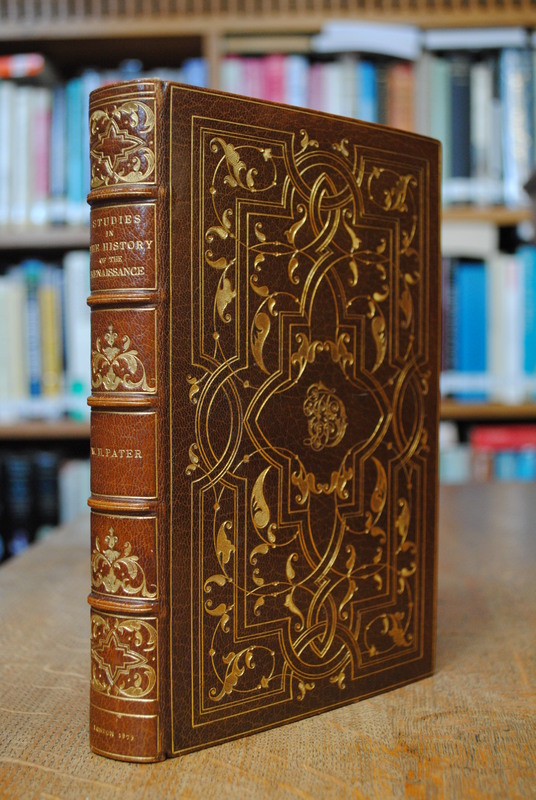 Emilia Pattison would go on to produce her own volume on The Renaissance of Art in France in 1879, together with more books on French art later in the century, as a clear testimony that the Victorian interest in the Renaissance as both a historical period and a cultural phenomenon was not an exclusively male domain, presided over by the usual suspects: Ruskin, Pater and Symonds. 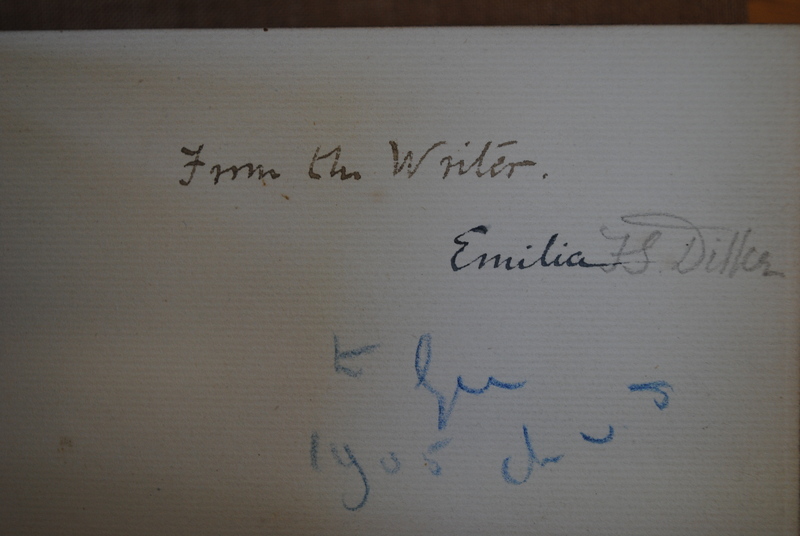 Women writing art history in the nineteenth century were leaving their own distinctive mark on the profession, as indeed Emilia Pattison left hers on Pater’s canonical first book, some four years after his death. She had her own monogram printed in gold on the front cover: ‘E[milia] F[rancis] S[trong] D[ilke]’ to indicate both ownership and appropriation. Before becoming part of the Sparrow bequest at Brasenose College, the book became a treasured object among male book lovers: bought by Paul Grinke of Quaritch Antiquarian Booksellers in London in 1966, it was sold on to John Sparrow, Warden of All Souls’ College in 1967. Sparrow was one of the greatest collectors of Pateriana in the twentieth century, from manuscripts to letters to books which had been part of Pater’s own book collection. In March 1988 Grinke wrote to Sparrow requesting him to sell the Emilia Dilke copy of The Renaissance back: ‘Of all the books that have passed through my hands in the last quarter-century that one still comes back to mind. You have enjoyed it for twenty years, so why don’t you sell it back to me?’ Fortunately, Sparrow had already bequeathed his Pater collection to Brasenose College, where both male and female readers may contemplate Emilia’s last dialogue with Walter Pater. 1See the documents relating to Emilia Dilke’s copy in Brasenose College Archives PP1 A6/8. 2Hilary Fraser, ‘Dilke, Emilia Francis, Lady Dilke (1840-1904)’, Oxford Dictionary of National Biography. The marriage, apparently, was not a very happy one, and has often been regarded as the source of inspiration for George Eliot’s Dorothea Brooke and Edward Casaubon in her novel Middlemarch (1871-71). After Pattison’s death in 1884, Emilia married Sir Charles Wentworth Dilke. 3See her review of his book in the Westminster Review n.s. XLIII, April 1873, pp. 639-41 (unsigned). 4The second (1877), third (1888) and fourth (1893) editions all appeared under the title The Renaissance: Studies in Art and Poetry. 5Quoted from R.M. Seiler, Walter Pater: The Critical Heritage (London: Routledge & Kegan Paul, 1980), p. 72. 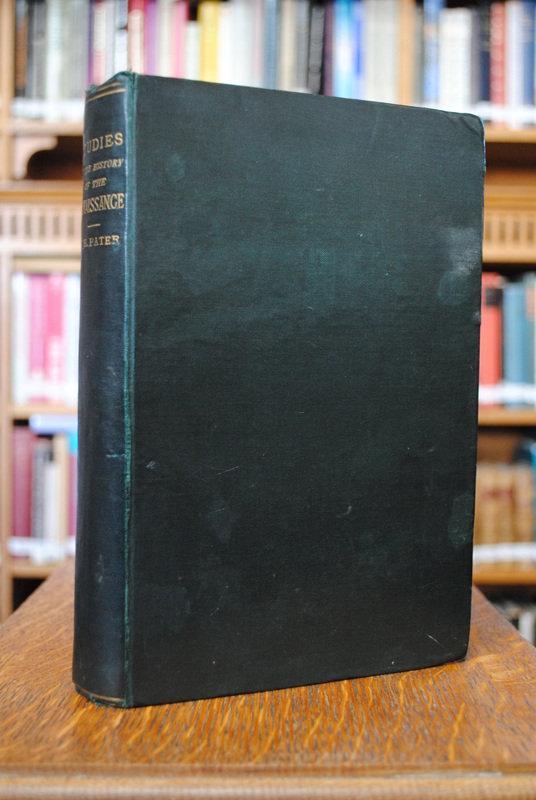 This entry was posted in Books, Library, Reviews and tagged Books, Brasenose, Brasenose College, Emilia Dilke, John Sparrow, oxford, Studies in the History of the Renaissance, The Renaissance of Art in France, Walter Pater. Bookmark the permalink.